As some of you may know, I have been a fan of Ed Emberley's work for a long time now...since I was about 7 or 8 years old, to be exact. 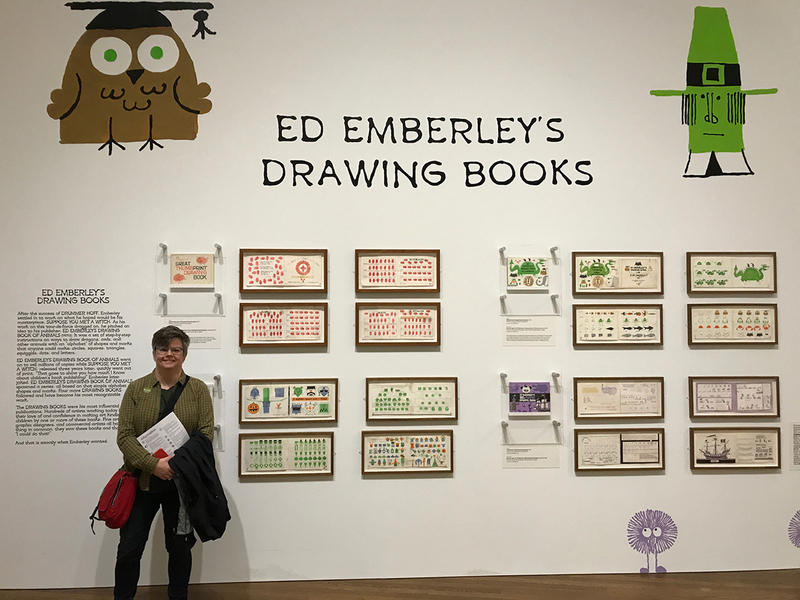 I first wrote about Ed's work on this blog 10 years ago, when I first started blogging, and then again in 2011, when I was invited to be part of the Cloudy Collection print suite featuring Ed Emberley and his work. This March, I had the distinct pleasure of meeting Ed and his wife, Barbara, at their home in Ipswich, Massachusetts. 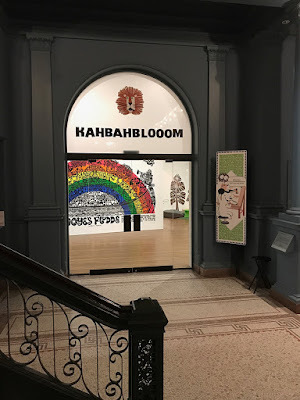 Last November, I heard that there was going to be an exhibit of Ed Emberley's work at the Worcester Art Museum, entitled KAHBAHBLOOOM, in Worcester, Massachusetts. I immediately checked the museum website to see the dates of the show. Although I was relieved to see that it was going to be up through the first week of April, I really wasn't sure that I'd be able to see it because of my semester load. Then, in February, Juxtapoz magazine ran a feature on Ed and the show and I was hooked; I had to see it. Thanks to my husband, we did! Since I was part of the Cloudy Collection print suite with Ed back in 2011 (which you can still purchase! ), I decided to reach out to David Huyck, curator and creator of the Cloudy Collection, to see if he happened to have Ed's contact info. A few days later, I emailed Ed to let him know that my husband and I were going to be traveling to Boston to see his exhibit at the museum in Worcester and to see if he'd be up for a studio visit. Ed and his wife Barbara graciously replied and invited us to join them for lunch at their home in Ipswich. 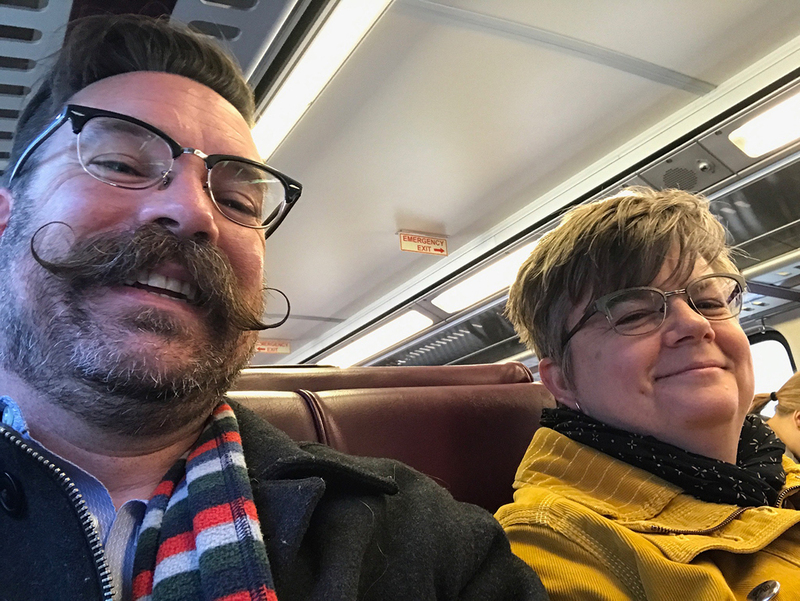 Needless to say, I was beside myself and so incredibly excited to go to Boston, see the show in Worcester and ultimately, meet Ed. 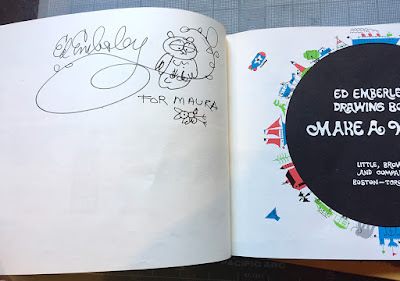 If anyone had told 7 year old me that I would one day meet the artist/illustrator who made the drawing books that I loved, I wouldn't have believed them! 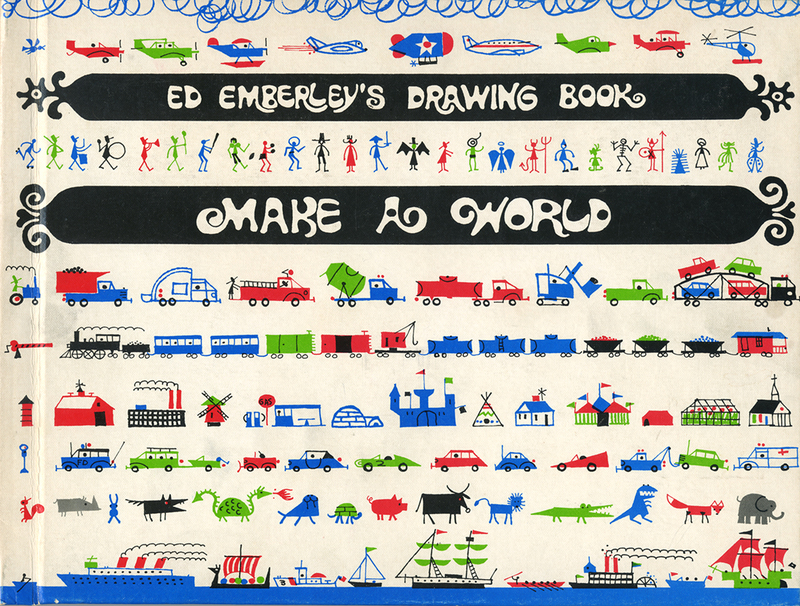 My favorite part of the exhibit: Ed Emberley's Drawing Books! 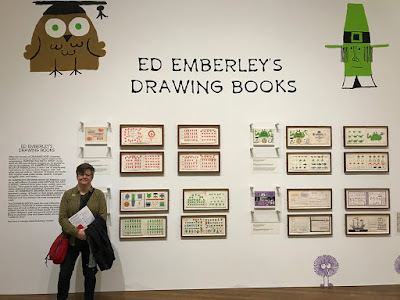 I loved the show, overall, but my most favorite part of the exhibit was the huge wall of original artwork taken from the various drawing books that Ed has created. 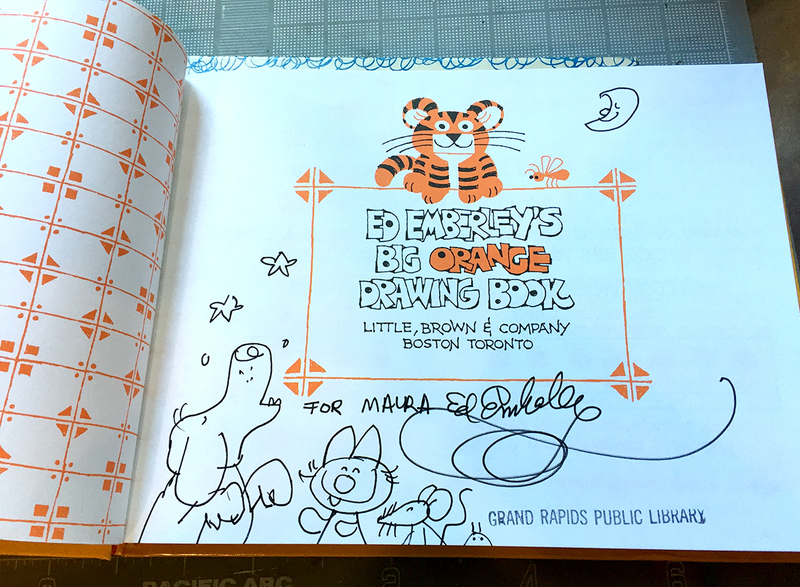 It was so inspiring to see these in person; seeing these pages brought back all sorts of memories for me. I've spent so many hours with these books; I love them! Not only did these books encourage me to keep drawing but they also opened up my imagination and taught me how to see. If you can draw these things, you can draw anything! 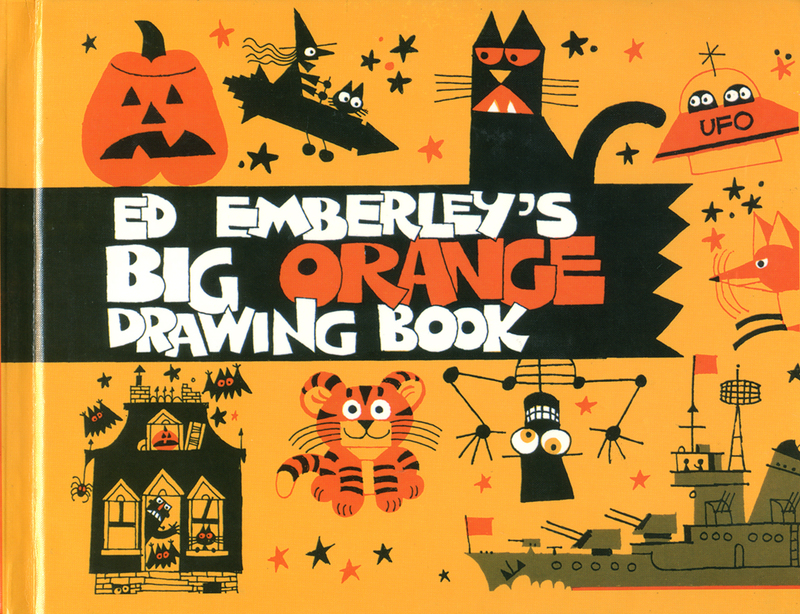 Just about every drawing book of Ed's starts off with these simple instructions: If you can draw these things (a capital U, a capital D, a circle, a triangle, a square and a squiggle), then you can draw everything in this book. The instructions are easy to understand, simple to follow and overall, encouraging and empowering. I poured over these books and after spending so much time with them, I started to invent my own things based on this same "Shape Language" (for lack of a better description). I created my own characters, faces, worlds and robots! 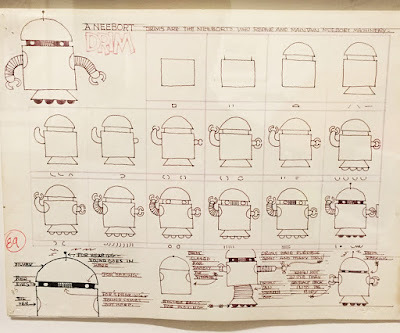 Seeing the original artwork for the Neebort DRIM (from the Big Purple Drawing Book) was an incredible treat! 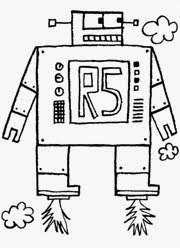 I love this robot not only because it's fun to draw but also because it sparked my imagination. For that matter it still does, so many years later! 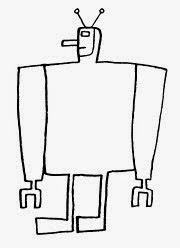 I love all of the simple shapes in this little bot, and how they come together. What these instructions taught me was that just about everything can be broken down into shapes; I started seeing shapes everywhere. I still do! The day after we went to Worcester to see the show, we caught the train out of Boston to Ipswich, where Ed and Barbara live. My husband and I were both really excited and admittedly, a little nervous. As soon as we got to their house, however, my nervousness disappeared. Ed greeted us at the front door with open arms. 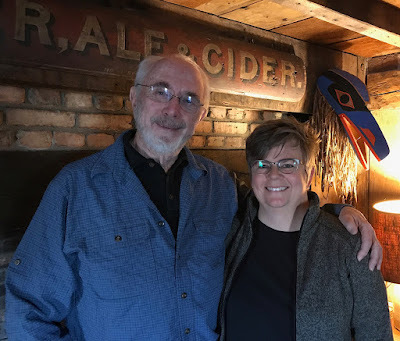 Ed and Barbara are wonderful and we had a great visit with a wonderful lunch, great conversation, some tasty local beer, lots of laughter and all around warmth. 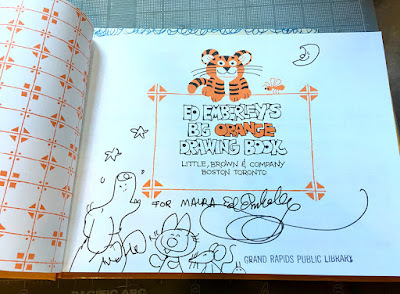 We talked about everything from the book and illustration industry, being an artist, the influx of technology and how it has influenced art and art-making today to what kinds of pens, markers and other art supplies we love to use - it was all over the place! I am incredibly grateful. My two favorite Ed Emberley drawing books, signed by Ed himself! Remember those two books that were pictured at the beginning of this post? Well, I brought them with me and Ed was kind enough to sign them for me. 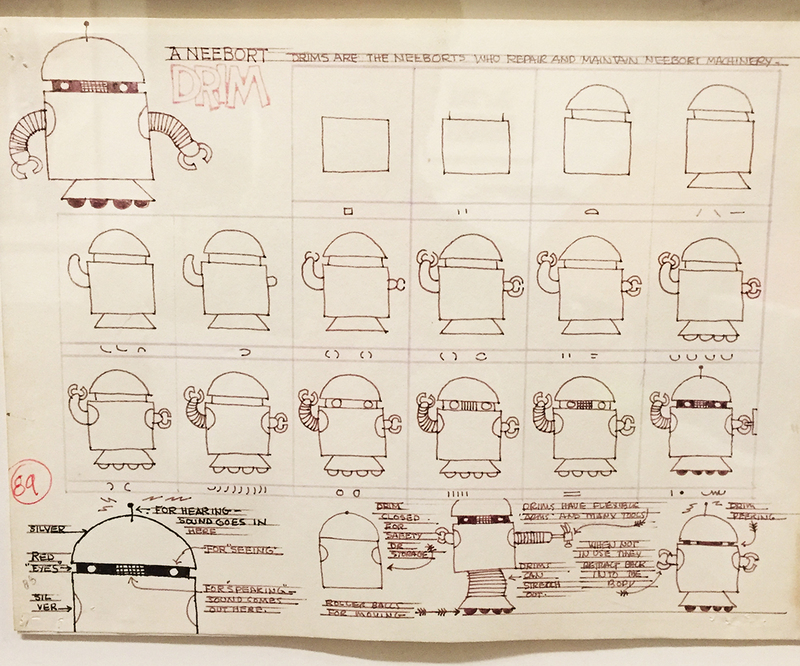 I love the drawings he did in each of them. 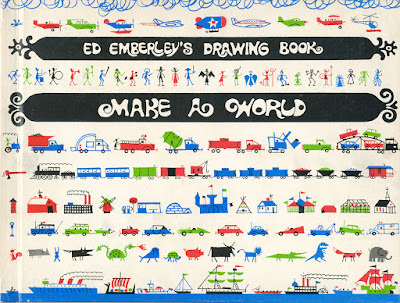 I brought a couple of things that I made to give to Ed, too, which he seemed to enjoy. This exchange ended up sparking a conversation about why I haven't written and illustrated a book of my own yet. I guess I never really thought about it but upon returning home to Kansas City, I sat down and started writing. 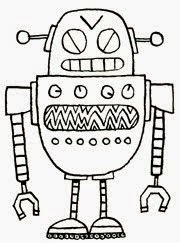 I now have a rough draft of a goofy, rhyming book for toddlers that features robots. Of course! Ed and Barbara, thank for opening your home and studio to my husband and I for an afternoon. Thank you for the stories, the conversation, the advice and the encouragement. 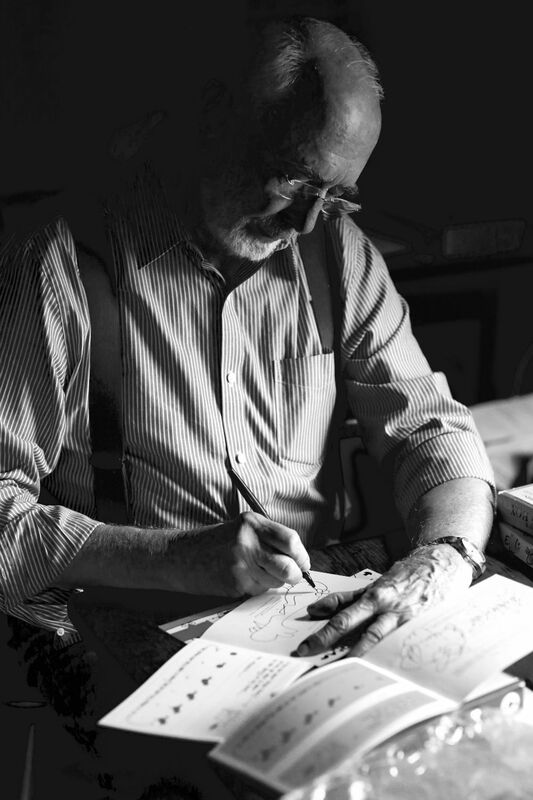 Most of all, Ed, thank you for the inspiration, your generosity and for simply being you. Thank you for allowing me to thank you in person, and talk with you. 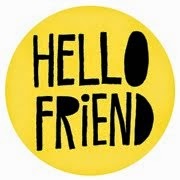 I know that your books will continue to marvel, excite, encourage and inspire generations to come. When we got home I began thinking about creating something to commemorate the trip. 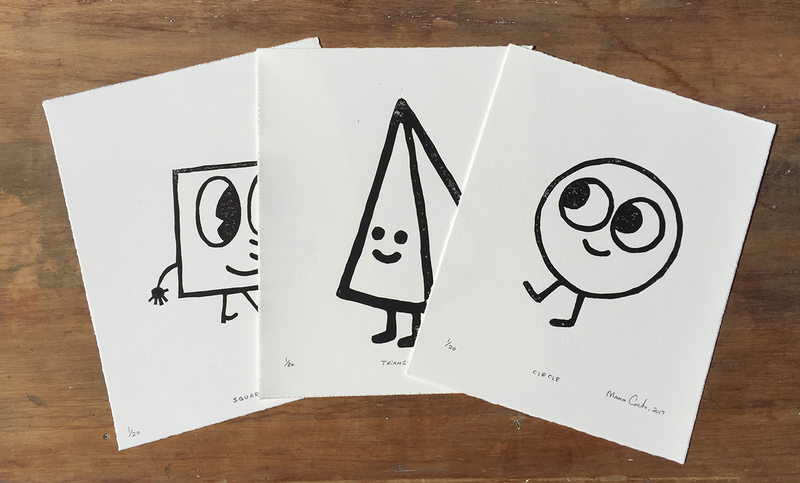 I have a bunch of drawings that were part of another piece and as I was looking through them these 3 happy shapes - a circle, a triangle and a square - jumped out at me. These are the 3 shapes that Ed tends to highlight in the simple instructions at the beginning of every book, so I thought I'd make some linocuts of them. These are now available in my shop. Big thanks to my mom, for all those visits to the Bloomfield Hills library every week so many years ago, to Martin Venezky for reminding me about what's important, to Bob Flynn for the great tour of Fable Vision studios and the wonderful conversation, to my cousin Kelly for taking time out of her busy schedule to have dinner with us, to David Huyck for his help and for including me in the print suite back in 2011 and to my wonderful husband, Jake, who understands how important this trip was to me, for encouraging us to go and making it happen.